It’s the end of April and I’ve just returned from a fabulous mother/daughter sorority weekend with my daughter at her college. I’m so glad to see her thriving with terrific friends, enthusiastically engaging in the sorority experience, excited about her classes and already looking forward to sophomore year housing plans, campus internship, winter service trip to Ghana and professors she’ll be learning with. This is a big change from my daughter during my visit for Parent’s Weekend in mid-October and much of her first semester. During those times, she was often feeling very lonely, questioning whether her school choice was the right one and missing home immensely. As a person who jumps right into new situations, who has a wide array of close friends from many phases and stages of life and who has a lot to offer, she (and we) had not fully anticipated that the college adjustment process would be much more gradual than expected. Best Years Of Our Lives? Our kids often hear us reflecting on college as being the “best years of our lives”, where lifelong friendships were formed — I even had the luck of being (randomly) paired with a roommate who became one of my closest friends from day one of college. Meanwhile, these newly minted college freshmen are still trying to figure out who to have their next meal with at the dining hall, if they will have anyone to go to a party with that night – let alone wonder if anyone at school will become as good a friend as those they had at home or camp. Though it sounds cliche, in most cases it is true that IT. TAKES. TIME. With time and perseverance, new college students will push through and find “their place,” meet “their people”, have experiences that will make them feel at home, and begin to have — and enjoy — the experiences that initially attracted them to their school. It takes time for friendships to form. Acquaintances or fast friends from first semester may not evolve into closer relationships — whereas someone they casually met or new people they meet through a club, sport or sorority may become the true friends. They need to adjust to the college workload, and start to get a sense of their potential major and what professors they want to have next semester. And if the reality of life at school is ultimately not what a student envisioned, the decision isn’t permanent – some may decide to leverage the learnings and transfer to a school that is ultimately a better fit. Though I am admittedly stereotyping, I’d say this is tougher for girls – in general, they tend to be more sensitive, more emotional and more self-conscious — and where there are girls, there is usually some form of drama. Boys often seem to bond over watching or playing sports, having a beer together or just goofing around. And in the end, the experience is different from each person – for some it will be very smooth, and for others it will be more challenging. My daughter and I are both honest when asked “how’s it going” — we share that the beginning was tough and that it is going great now. I am sure there will be more ups and downs to come over the next three years. We have since heard from many other people that their children had a challenging time adjusting to college and the situation gradually changed for the better. As a parent wanting to pay it forward to other parents – keep all this in mind as your young adult leaves home to embark on his/her college experience. Here are two resources I found helpful and you would be amazed by how many articles come up if you google “college loneliness”! By Tracy Levine, a mom of a current and future college student, who greatly values sharing learning with each other to help us all succeed and enjoy this journey called life. 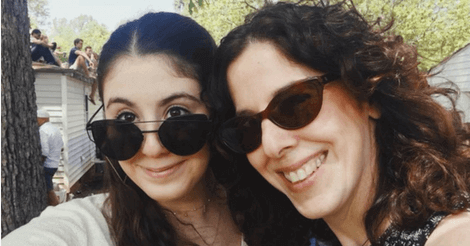 Following a 20-year career in corporate marketing, Tracy is enjoying her “second career” as a Jewish communal professional in the camping field – she’s a big believer in overnight camp as great prep for college, as well as having fun and a much-needed break from technology! Thank you for this heads up article. So beautifully written.